TFY 4240: Electromagnetic Theory (Fall 2009, NTNU openVideo). Instructor: Professor Paul Anton Letnes. 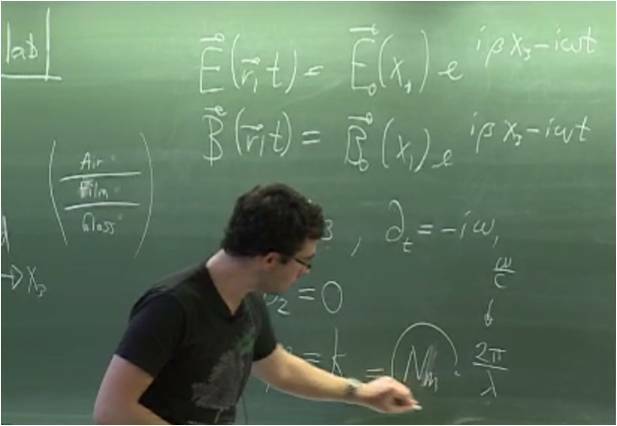 This course investigates Maxwell's equations and mathematical methods related to them in more depth. The topics in this course are roughly the following: Electrostatics, method of images, multipoles, electric fields in matter. Magnetostatics and magnetic fields in matter. Electromagnetic force and induction. Maxwell's equations. Conservation laws for charge, energy, momentum and angular momentum. Electromagnetic waves. Electromagnetic fields in waveguides. Potential theory and Gauge transformations. Radiation from dipoles and charges in motion. This course is a continuation of the introductory course TFY4155. We investigate Maxwell's equations and mathematical methods related to them in more depth.